Our commitment to awesome runs deep! 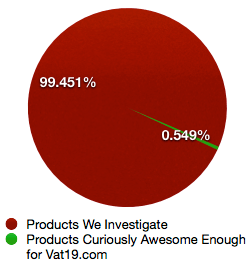 At Vat19, we investigate thousands of potential products every year, yet only a select few make it onto the site. Why? Because we believe in only selling you the most curiously awesome products in the world. Plus, they've got to pass the CAT (Curiously Awesome Test). Trust us, it's quite difficult. 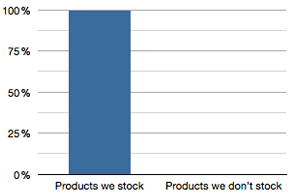 To help visualize our pickiness, please check out the very un-scientific pie chart to the right. See that tiny sliver of green? That's the good stuff - the "curiously awesome" stuff. It's hard to find unless someone (like Vat19) searches it out for you. Check out some of our most popular items for a little taste of what it means to be "curiously awesome". We're not just here to sell you stuff. We genuinely want you (and the people you're gifting) to love the products you buy. So, we create informative and entertaining videos (910 to date) to showcase the features and functions of our unique brand of curiously awesome products. That way, you know exactly what you're getting. And hopefully, you'll have a little laugh too. Order before 2PM CT and we'll ship your order the same day (excluding weekends and holidays). Please note that same day shipping does not mean that your order will arrive the same day that you place the order. When choosing shipping options, please also note that your proximity to our warehouse in St. Louis, MO can decrease delivery times dramatically. For more info about same day shipping, click here. You want to feel confident you know exactly what you're buying, right? Right. Many shops make it hard to get familiar with their products by simply regurgitating the manufacturer's product description (boo!) and photos (double boo!). Heck, they've probably never even opened the item and tried to use it. At Vat19, we take our own photos, write our own descriptions, and create our own videos. We think you deserve this attention to detail so you can feel confident with your purchase. Plus, we're not going to go through all of that trouble unless we know the product is fantastic. 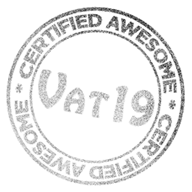 So, if it's on Vat19, you know it's certified awesome (as evidenced by our cool-looking stamp to the right). Our obsession with customer service starts at the top of the company. The evil boss, Jamie Salvatori, reads every single email that you send. This allows him, when necessary, to take immediate action to remedy a problem or to pass it along to the appropriate customer service representative. We have real humans awaiting your call. During our regular business hours, you can speak to a live human who works at Vat19. Outside of our business hours, please leave us a message or send an email. A representative will respond as soon as possible. We look forward to hearing from you! Additionally, our staff is knowledgeable about every product we sell. So, if you have a question (no matter how specific), we can answer it or will do everything in our power to find the answer. In fact, we've answered and posted to our site over 134,047 of your questions. #6: "In Stock" means we really have it! If that awesome product is listed as "in stock", it's ready to ship immediately. We don't do backorders which means no waiting. When you order from Vat19, we ship that day or the next business day. Your entire order will ship together in one box unless you buy a ton of stuff, which we wholeheartedly encourage. In those cases, we may have to ship more than one box, but rest assured that it will all ship at the same time. When choosing UPS shipping methods on Vat19.com, we'll show you the exact date when your package is guaranteed to arrive (even on UPS Ground shipments). 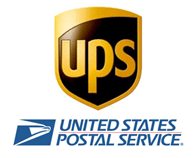 Because we're centrally located (St. Louis, MO), you may find that a UPS Ground package will arrive the very next day! This can save you loads of cash because you can avoid the costs of expedited next day or second day shipping. Click here for more information on our shipping policies or click here for a complete list of countries to which we'll ship and here for a list of frequently asked questions. Unfortunately, we can't give away all of our products for free. Terrible, right? However, we do accept all major forms of credit card (Visa, MasterCard, Discover, and American Express) as well as PayPal. #10: We've answered 134,047 of your questions! The entire team at Vat19.com is so committed to your satisfaction that we eagerly welcome any and all questions about every curiously awesome product on our site. Need more reasons why Vat19.com is awesome? Check out our newest products.